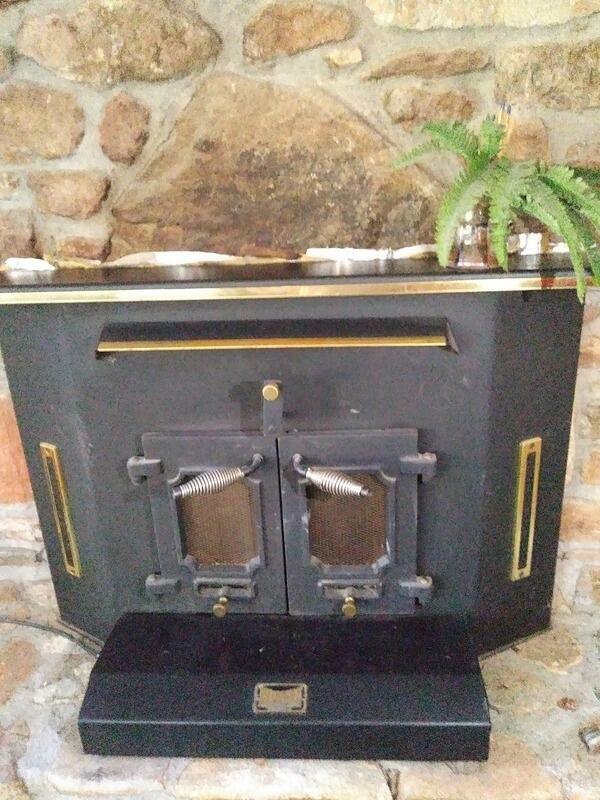 Anyone familiar with fireplace inserts? I have a fireplace in my metro home - never used it. I think it's called a prefab - wood-enclosed chimney. And right now it's gas. I feel like gas logs are a waste of gas if you have gas forced-air heating - purely a decorative'/romantic kind of thing. I come and go on pulling the logs out and going back to wood. Now I have an opportunity for an insert. Anyone familiar with inserts? I've kind of heard lately that they're not that great. Just curious about the superiority between a wood fire and an insert. If it's vast, that's great. If I only pick up a small amount of efficiency, it's kind of ugly. Don't know many details. They want $125 and it looks like this. The gold trim makes it look old to me. Re: Anyone familiar with fireplace inserts? it depends on the blower and how much insulation you have behind it. Nothing will beat a free standing stove, but a insert with a blower beats a open fireplace in a hearbeat. It uses the steel sides and back to capture the heat and the blower to try and redirect it back out into the room instead of up into the chimney. Most people I know ended up pulling theirs out and just blocking the hole completely except for a pipe going thru from the stove they replaced it with. If it were me, I would look at a small free standing stove using the existing chimney. They give off so much more useable heat for the room. I'm kind of leaning against it. Sheltering in place at home is definitely "Plan B". And it would ruin the charm of an open fire in the meantime. They also have a $100 jonboat. I might get that and look at the insert while I'm there. if it's something that two people can move around without equipment, maybe I can store it in the basement as a deep prep. There's also some concern about my chimney not being suitable. I used an insert for a few winters and it puts out a lot more heat than a fireplace plus it uses less wood for the same heat but you really need a flue liner to make it draw well. You may already have a flue liner in your chimney, if so measure and learn if it's a 6" or an 8". there are adapters but it's best to know before you buy the insert. The trouble iv had with inserts is replacment parts. I got rid of my buck stove last year as the motor died and all the replacement motors had poor reviews on there life span. As stated they are better then a fire place but dont heat like a standalone stove. Its was also terrible to cook with, just a 4” ledge to put a pot on and it would only get warm. Im currently using the fireplace as a cooking hearth with a bar to hang pots when im using it, i am much happier with this set up, the boys love to make hot coco with the teapot on the grate. Ideally though i will get a small standalone with a dual cooktop to put in there. The farm house we rented in Maryland had old single pain windows but the little wood stove in living room heated it very well, the insert here in GA even though the winter is milder didnt even come close. Good price though , if your fall back is a fireplace for heat only, grab the stove its better then a draft.